I have a stack of postcards to post here. The past week has provided 18 returns and 2 unsolicited postcards. My original fears of people disregarding Business Reply Mail postcards as junk have subsided. This card is from the 4th Batch sent out in February. Mia was the volunteer as indicated by her zodiac symbol up by the fox stamp. I don’t know when she placed it but it looks like she placed another one around the local Vancouver theater scene. 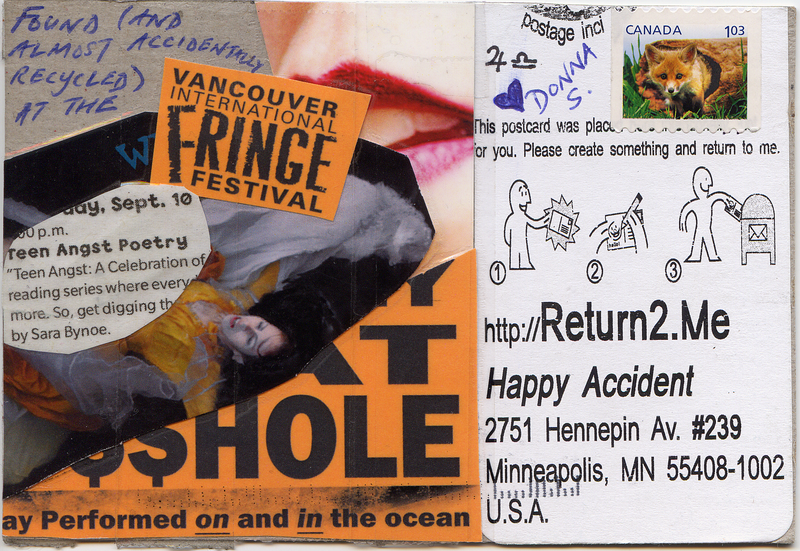 This entry was posted in Batch 004, Canada, postcard, return, Vancouver and tagged Donna S., Fringe Festival, Recycled, Teen Angst Poetry. Bookmark the permalink.